Air pollution in our biggest cities is much worse than most of us have realised. It averages well over twice World Health Organisation (WHO) guidelines and legal limits near many of London’s busiest roads. Mayor Johnson has estimated some 4,300 deaths in London in 2008 were attributable to long-term exposure to dangerous airborne particles alone. 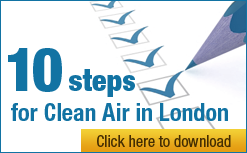 Clean Air in London’s (CAL’s) mission is to achieve urgently and sustainably full compliance with WHO guidelines for air quality throughout London and elsewhere. It works closely with other campaign groups and a wider network of supporters and volunteers to identify and build understanding of the most important issues and encourage decisive action on them. CAL’s immediate priority is to see that air quality laws are enforced rigorously. CAL believes that if we comply fully with relevant laws Britain can show the world how to tackle successfully air quality, climate change and sustainability issues. CAL is a not-for-profit organisation funded by donations, sponsors and other supporters. It is not a charity in part because a registered charity is not allowed to have political objectives or take part in political lobbying (other than in a generally educational sense). CAL may wish to participate in such activities. CAL is a company limited by guarantee, registered in England and Wales, with company number 7413769 and registered office address Thames House, Mere Park, Dedmere Road, Marlow, Bucks SL7 1PB. Note: After making a donation you will be asked to click a button to register your donation with the App (to stop future requests to donate to it) and return to the App.